Support groups can be a wonderful thing. I spent many an evening sitting on a chair, a floor, a couch, surrounded by people battling the same thing I was. I have always wanted to find a way to run a nutrition group for people with eating disorders, but I haven’t found a good way to do it – yet. One of the groups people most request is a meal planning group. 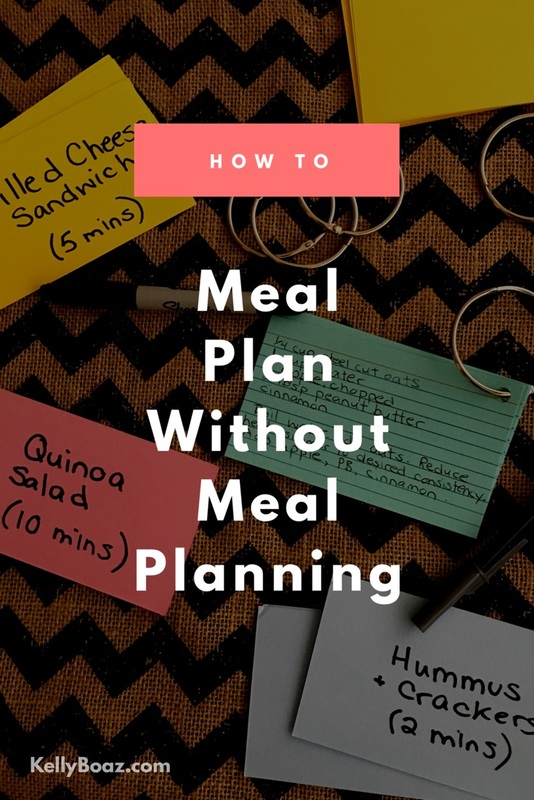 Here’s why I’m hesitant to start one, and something you can do on your own to make meal planning easier. In my years of work as a holistic nutritionist, I have yet to meet two people with the same nutritional needs. Everyone needs a different number of calories to feel their best. Every person needs to eat different types of foods at different times and intervals throughout the day to feel their best. Everyone has different obstacles to maintaining their meal plan. I can think of no two clients to whom I could give the same plan successfully, and I don’t. In my practice, I meet people where they are at when they walk through my door. As time goes on, we evolve their plan to suit their needs, and to move them closer to where they need to be. This can’t be accomplished with a standard meal plan. As I stated before, no two clients require the same number of calories, types of foods, or frequency of meals. In a group setting, these differences can be triggering. For example, when I was in residential treatment, the kitchen staff once left pieces of paper with our individual calorie allotments on each of our trays. Those with high numbers were terrified. Those with low numbers were mortified. Why didn’t they need as much food? Was the staff telling them they needed to lose weight? Needless to say, it was a tearful meal for all. While I make a point of not basing my work on calorie counts, it can still be triggering to see differences in amounts of food. I’ve been in groups where number of snacks required or cans of Ensure needed were used as status symbols. While these triggers are important to tackle at some point, a nutrition group is not the place for that work. While meal plans can be incredibly useful in early recovery, a meal plan is not forever. Meal plans are for getting to some semblance of “normal” eating, so you can figure out what normal looks like for you. You may need more food than what is on your initial meal plan, you may need less. It may vary from day to day. That’s what being a human is all about. After a while, you will transition from meal planning to eating intuitively. It can be really, really scary. Often, clients new to eating without a meal plan will forget every single meal they know when they’re flying by the seat of their pants. But you don’t have to COMPLETELY fly by the seat of your pants. Here’s one of my favorite tools for meal planning without meal planning. Hopefully, your meal plan will have included a wide variety of foods, and left room for a little experimentation. You should have several different breakfast, lunch, dinner, and snack options. For each option, write its name and approximate prep time on one side of an index card. On the reverse side, write the ingredients you’ll need, along with cooking instructions. Organize them into piles by meal. You can do breakfast, lunch, dinner, snack, or breakfast, lunch/dinner on-the-go, lunch/dinner at home, snack, or something of your own invention. Then, punch a hole in the top corner of each card, and organize them on a binder ring according to prep time. Then, when you’re stuck for a meal idea, or wondering what you can make in 2 minutes since you slept through your alarm, or are trying to figure out what to make with what’s in your fridge, you’ve got all the information at your fingertips. Each time you learn a new recipe, you can add it in to the appropriate ring. But about that group . . .
As of right now, I haven’t come up with a good way to do a nutrition group for those with eating disorders. It’s something I think on often, though. As soon as I figure it out (if I figure it out), you’ll be the first to know! What are your favorite tips for meal planning, or for learning to let go of a meal plan? Let me know in the comments, or tweet at me! GREAT BLOG! It touched on a lot of points recently discussed in a Nutrition and Well-Being Class/Group that I’m a part of. It has also presented with a few more aspects yet left undiscussed. I plan to bring forth these points, as well as provide this link to my Group.